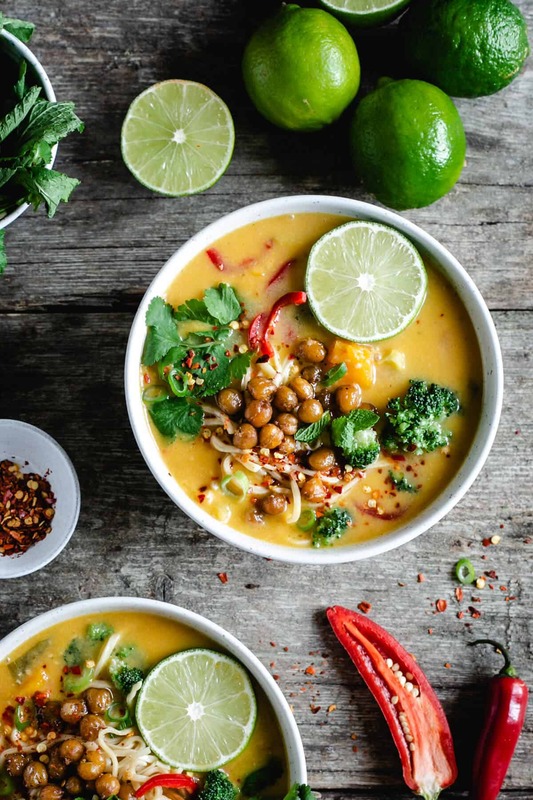 Thai style pumpkin laksa- the most wonderful bowl of soup to warm up with on a cold day! Perfect for weekend lunch or mid-week dinner! 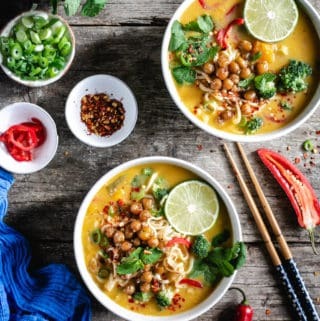 Thai style pumpkin laksa- an ideal autumn or winter warmer! When the days are getting shorter, and the outside starts getting that cool and crisp feeling in the air, I naturally start craving cozy, hearty dishes. 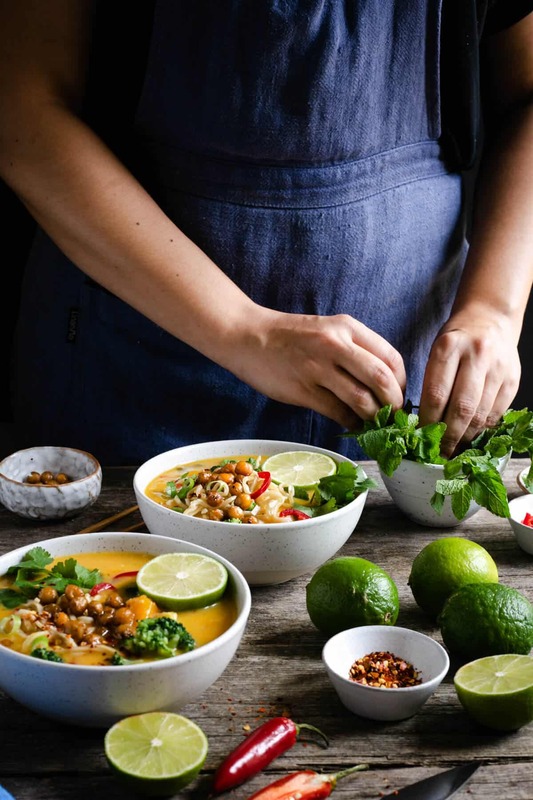 Today’s recipe for pumpkin laksa is guaranteed to satisfy all these cravings! 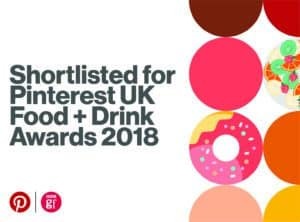 Plus it’s packed with warming flavours and spices which will make you feel like you just received a hug from a cuddly bear. Yup, it’s seriously that good! Laksa is commonly known as a spicy noodle soup, and it’s very popular in Malaysian, Indonesian or Thai cuisines. Traditionally, it consists of rice or vermicelli noodles, some chicken, fish or prawns and spicy soup base made with curry coconut milk. There are tons of different recipes and variations of laksas out there, and they are super easy to customise and make exactly the way you want it. How to make Thai style pumpkin laksa? I’m trying to keep this little tradition of mine going- only pumpkin-related recipes in October, just as I did last year. If you dig into my archives you will find this roasted pumpkin salad, spiced apple and pumpkin hand pies, or this pumpkin and root vegetable gyozas just to name the few of them. 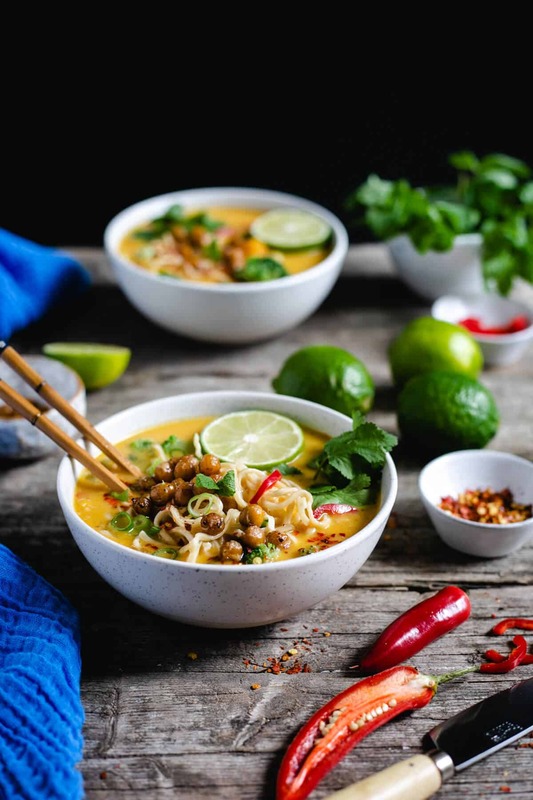 The idea for this pumpkin laksa came to me after seeing this fabulous recipe from Half Baked Harvest. Making this recipe couldn’t be simpler. Start with peeling and chopping your pumpkin or squash of choice. After that, move to preparing the soup base. As in most Thai style dishes, that base is created by combining garlic, chilli, ginger and lemon grass. Ensure that your pan is hot before adding sesame oil and the base ingredients to it. Once they start releasing their lovely fragrance and aroma, you add vegetable stock and pumpkin/ squash. While you’re waiting for pumpkin/ squash to be soft and tender, cook the noodles according to pack instructions. As mentioned earlier, traditionally, laksa is served with rice noodles, however, as I’m not a big fan of them, I’m substituting them for medium noodles. When the pumpkin is cooked through, blend about 3/4 of the soup in a blender. You want to leave few chunky bits out, they will add more texture and flavour to the soup. All that is left is to add tamari, peanut butter, miso paste, coconut milk and broccoli. Bring to boil, add some coriander, top up with fresh mint and crispy chickpeas. Et voila- your pumpkin laksa is ready to serve! 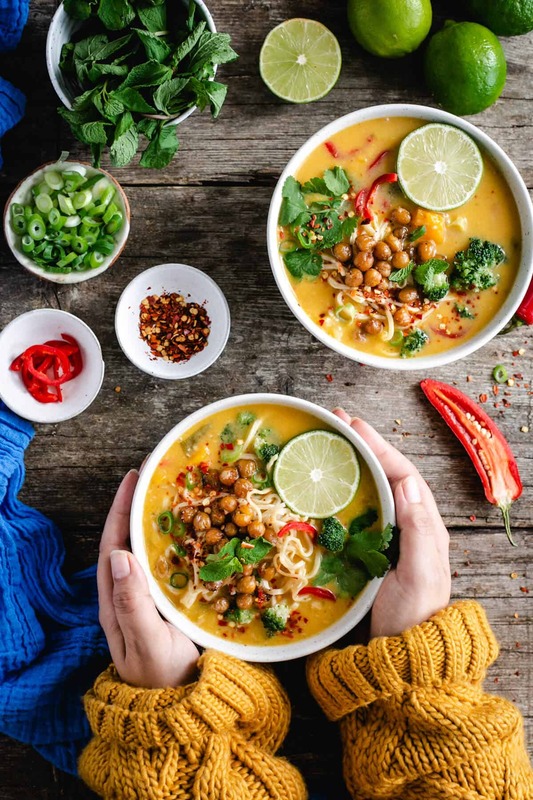 Topping this pumpkin laksa with roasted chickpeas is totally optional, but also totally worth it (also, hello all the extra protein!). It may take just few extra minutes in preparation, but you will be glad you’ve done it, trust me! Making crispy, roasted chickpeas is nothing new to me, but adding them to soups or salads is a quiet recent thing. 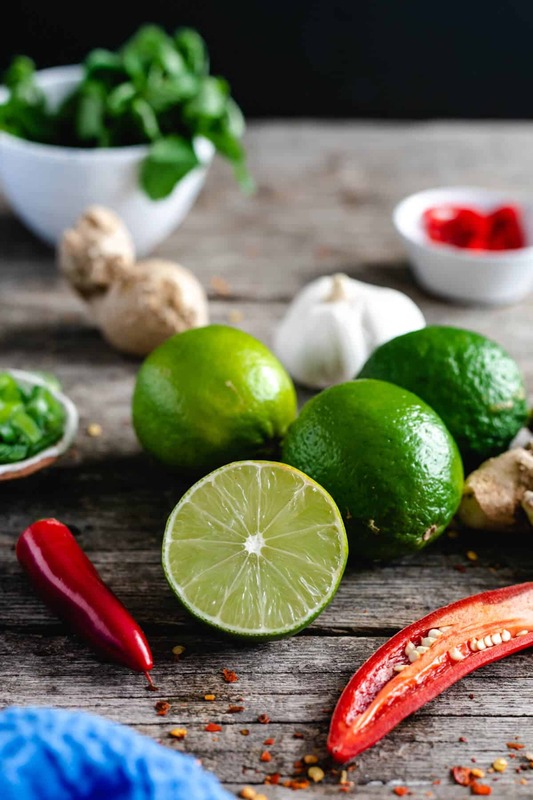 You can coat them in your own selection of spices, and they will add more interest, texture and flavour to your dish. Not to mention, they are totally yum! Crispy, crunchy, spicy goodness, which is good enough to eat on its own! Thanks for reading, and as always, I would love to hear from you! Feel free to leave me a comment below, even if it is just to say hello! Also, make sure to sign up to my weekly newsletter, so all the latest recipes can go straight into your inbox! 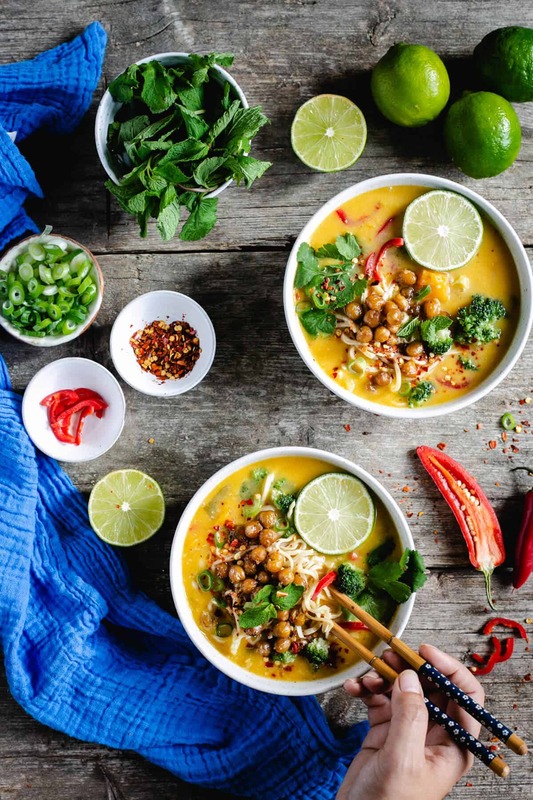 This pumpkin laksa is the most comforting noodle soup you've ever made! Infused with Thai flavours and spices, it is guaranteed to warm you up even on the coldest day! Place a large saucepan on a medium heat and add sesame oil. Once hot, add garlic, ginger, chilli, lemongrass and spring onion. Fry for about 1 minute until soft and aromatic. Stir in the vegetable stock and add chopped pumpkin or butternutsquash. Bring it to the boil and simmer for 15- 20 minutes until pumpkin is soft and tender. Add about 3/4 of the soup to the blender or food processor and blend until it is super smooth. Return the blended soup to the pot. Add peanut butter, tamari or soy sauce, miso paste and coconut milk. Stir to combine all of the ingredients. Add the broccoli and cook until tender for about 8 more minutes. Meanwhile, cook the noodles according to the packet instructions. Once the broccoli is cooked, remove the soup from the heat and add the coriander and mint. Pour the soup into bowls and add noodles. Top with some roasted chickpeas (see below for the instructions), spring onion and some chili flakes (optional). Heat the oven to 170 C. Place all the ingredients in a medium bowl and toss the chickpeas until they are covered in oil and spices mixture. Place on a baking tray and roast for about 20 minutes until they are crispy. This looks incredibly comforting! 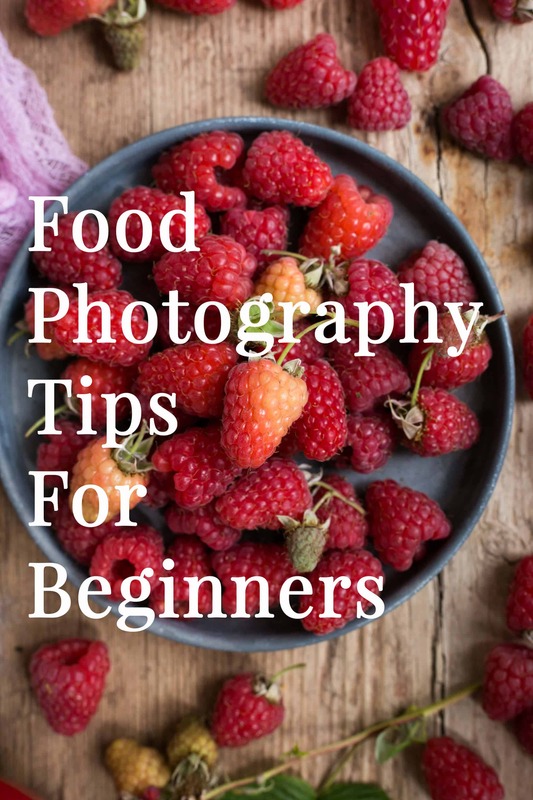 Love all those garnish and your photos are beautiful 🙂 Can’t wait to try! Ahh you’re too kind, thanks so much for your comment! It’s a great soup, especially at this time of the year! All the spices and flavours create this lovely warm feeling inside! We happen to LOVE Thai food. This looks amazing. Love the colours, textures and of course the flavours in this bowl of goodness. The perfect way to warm up on a chilly day. So happy to hear that you and your family also love Thai cuisine! 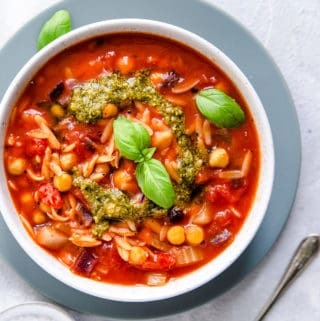 And this is a great winter or autumn warmer, nothing beats a big bowl of cosy soup on a cold day! I love Thai food and your recipe is awesome and perfect for these chilly winter evenings. It’s a great idea to add those delicious roasted spicy chick peas – I can’t wait to try it! Thanks so much for stopping by and this lovely comment! Roasted chickpeas are so good, and they are great on their own, we love snacking on them! I’ve never had laksa before but it looks amazing! Love the flavors you put together and the color is so beautiful! And as a chickpea fiend, I am totally on board for the addition of chickpeas! Yes, please! I’m very pleased to read that you like the recipe! And chickpeas are just so versatile, they go almost with any dish! Pumpkin Laksa sounds like the perfect comforting winter Recipe. Awesome idea ? Glad to read that you like this recipe! This looks so amazing! I am always on the hunt for new soups, and these flavors sound just perfect together. Beautiful photos, too! Thanks so much for stopping by and for your lovely comment! I’m also always on a watch for a good soup, especially this time of the year! Why have I never heard of this amazing pumpkin flavored noodle soup?! I love pumpkin in everything and I love noodle soup so this is a match made in heaven. I can’t wait to try it! I’m quite new to this idea too, and got really into the noodle soups after my last visit to Thailand last month. They are so nourishing and full of flavour, I really hope you will love this recipe as much as I do! Perfect! I love pumpkin/squash soup, but this is a new one for me – all the better! Thanks Anne! I really hope you will enjoy this recipe! These photos are beautiful! 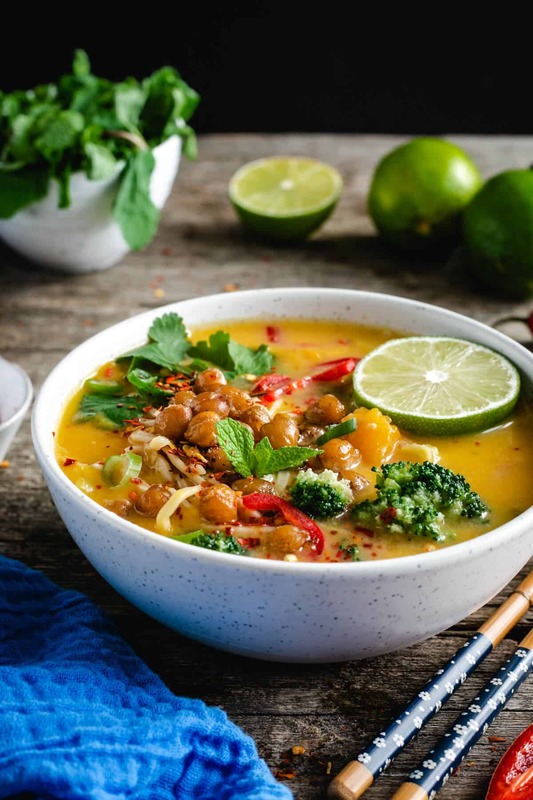 That cozy yellow sweater is pretty much all I want to wear this winter…while I eat this soup! So warming and comforting. Definitely in my playbook! I love how loaded up on veggies this is! I swear I can smell it already. Thank you Leslie, soups are so great to incorporate the seasonal produce into, and I do love adding different veggies for more interesting texture. These pictures are just beautiful!! 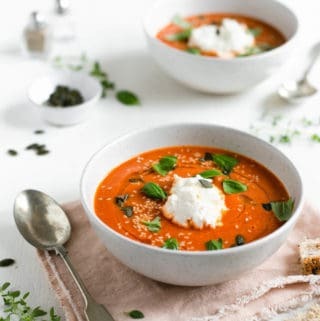 I am usually not a soup person, but this is such a gorgeous bowl of soup, even I want some! Hi Julie, Thanks o much for your kind comment! I can’t imagine surviving a cold day without a bowl of warm soup! Hope you will try it sometime! Yum, this looks like the perfect bowl of fall comfort! I love the flavour combos in here! Pinning to try later. Very happy to hear you like it and will be trying it out! Your photos are always great! This soup has fall written all over it! Aww Nicole, this is very kind of you! Thanks so much! The warm spices, the dark rich colors of the soup and garnishes, it screams Autumn and it needs to be made and savored. Hah, thanks Mary, and well said! I hope you will make it and enjoy it some time soon!